I lived in Texas for about 2 days before everyone and their dog was telling me all about this famous Chuy’s creamy jalapeno dip that I must try asap. Of course, I ditched unpacking in my quest to do some culinary research. Was it really as good as everyone said? I wanted to be the judge. Dean and I chose a weekend night and drove straight to Chuy’s. There was a line out the door and a long wait. That is always a good sign! People seemed to love this place — even if it was for the star of the show, the creamy jalapeno dip. We sat down and within minutes, the creamy jalapeno dip was sitting right in front of me. A basket of hot chips, fresh out of the fryer were beckoning me. I took the tortilla chip and dipped it into what looked more like a cilantro jalapeno dressing that anything and took the first bite. Wow. This stuff was straight up addicting. Before I knew it, Dean and I had devoured an entire basket of chips and he was asking for more. Trouble. I was hooked on this creamy jalapeno dip and there was no turning back! We just flew back to San Antonio last week for my darling niece’s wedding (hi Amanda!) I married into such a wonderful family and loved being with the Stadler crew. We had a Mexican feast on Sunday and another darling niece (I have a lot of them), Haley, was bringing it! 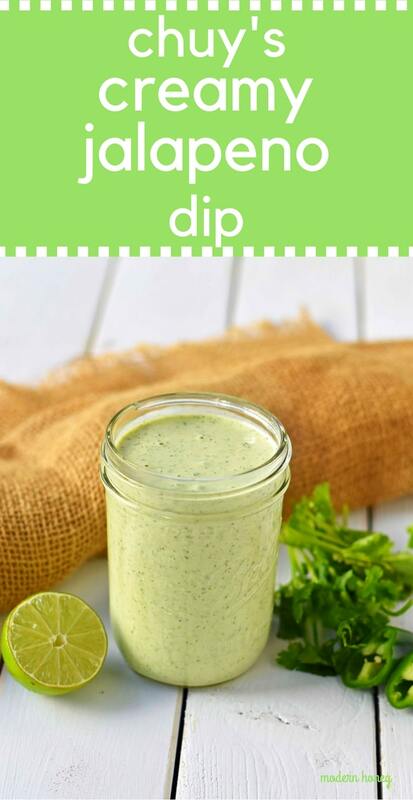 She is a little whiz in the kitchen and shared her version of Chuy’s famous creamy cilantro jalapeno dip. It was like watching vultures once she put it out. It was a huge hit and I begged her for the recipe! This is our version of the Chuy’s famous creamy jalapeno dip is super simple to make and can be whipped up in less than 10 minutes. I without a doubt could drink this stuff….all day long. It is also reminiscent of Cafe Rio or Costa Vida’s cilantro ranch dressing. You can use this dressing to drizzle on a salad, a burrito bowl, or just as an appetizer. 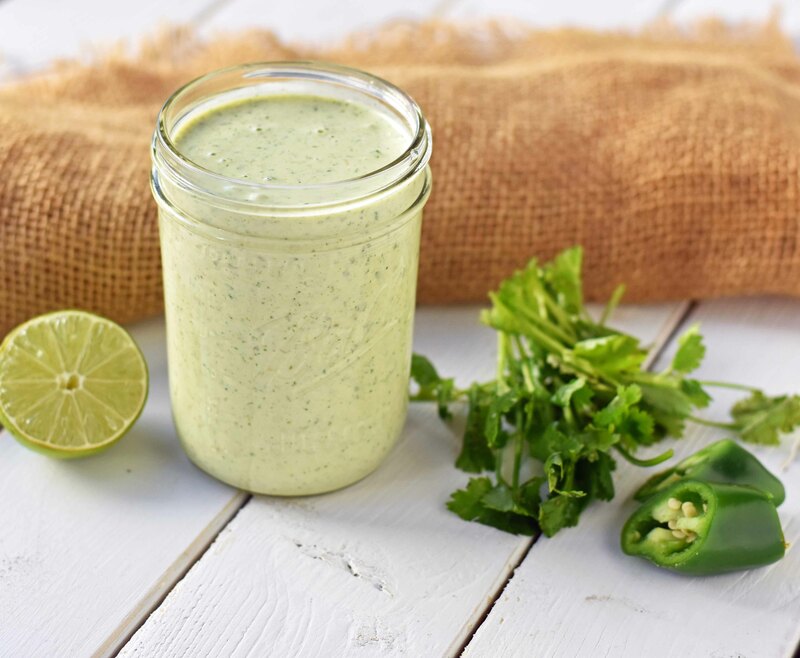 How do you make this famous Chuy’s creamy jalapeno cilantro dip dressing? You start with jarred jalapenos and cilantro pureed in a blender. You can use fresh jalapenos as well but I prefer the jarred jalapenos as I can control the heat. The jarred jalapenos are much milder than fresh ones but give off a crazy amount of flavor. Fresh cilantro brings the freshness and balances out the heat. 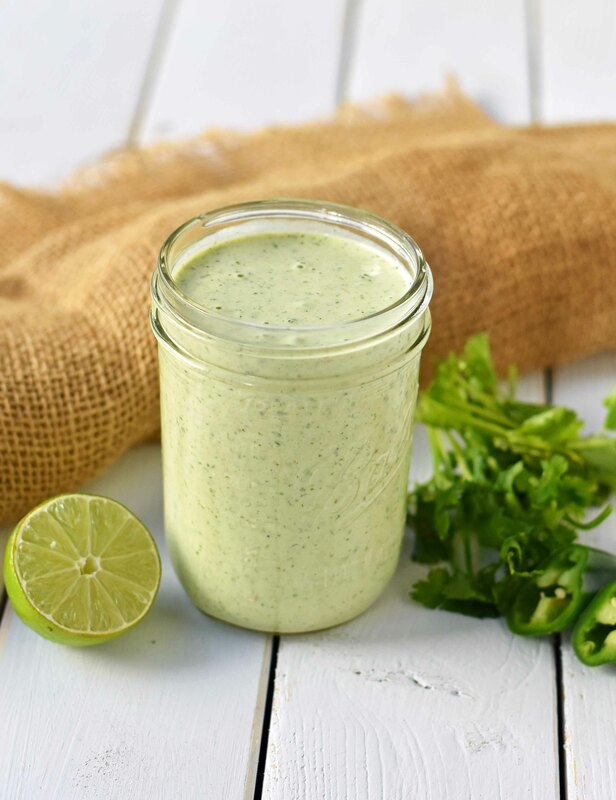 Both sour cream and mayonnaise are used as the base of this creamy cilantro ranch dressing. A packet of dry ranch dressing dip brings that ranch flavor that everyone seems to love. If you want to add more freshness, throw in a couple of tomatillos. You can use fresh tomatillos or canned tomatillos. Buttermilk makes a huge difference in this dressing and use just enough to thin it to desired consistency and taste. The jalapenos and cilantro are pureed in a blender or food processor. My favorite inexpensive food processor can be found HERE. 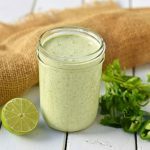 This popular dip/dressing can be a great dip for chips or a flavorful dressing on a salad or burrito bowl. In a medium mixing bowl, stir together sour cream, mayonnaise, ranch dip packet, and garlic salt. In blender or food processor, puree cilantro and pickled jalapenos with a little juice. (If using tomatillos, blend with jalapenos and cilantro). Add cilantro jalapeno puree to mayo mixture. Stir in buttermilk until you reach desired consistency. Add fresh lime juice, if using. I hope you love this copycat version of Chuy’s popular Creamy Jalapeno Dip! It’s a family favorite. Happy Eating, my friends! How long will this Chuy’s creamy jalapeno dip stay good in the fridge. Hi Stacie! Sorry, I am so late in the ball game getting back to you. This can store in the refrigerator for probably at least 3-4 weeks. Just place it in a jar and shake before you use it. I hope this helps! Do you think this would work well to be used as enchilada sauce? To be cooked on top of them? Hi Amy! That is a such a great question. I haven’t tried it yet so I am not sure how it would hold up under such high heat. If you try it, cover the enchiladas with foil while cooking so it doesn’t get too hot. Bake at 325 degrees. Good luck! 🙂 Let me know if you try it. Thanks! It’s yummy, but i would use less mayo. The flavor was a bit too noticeable for me. Thanks, Frances for sharing! Thank you for trying my recipe! 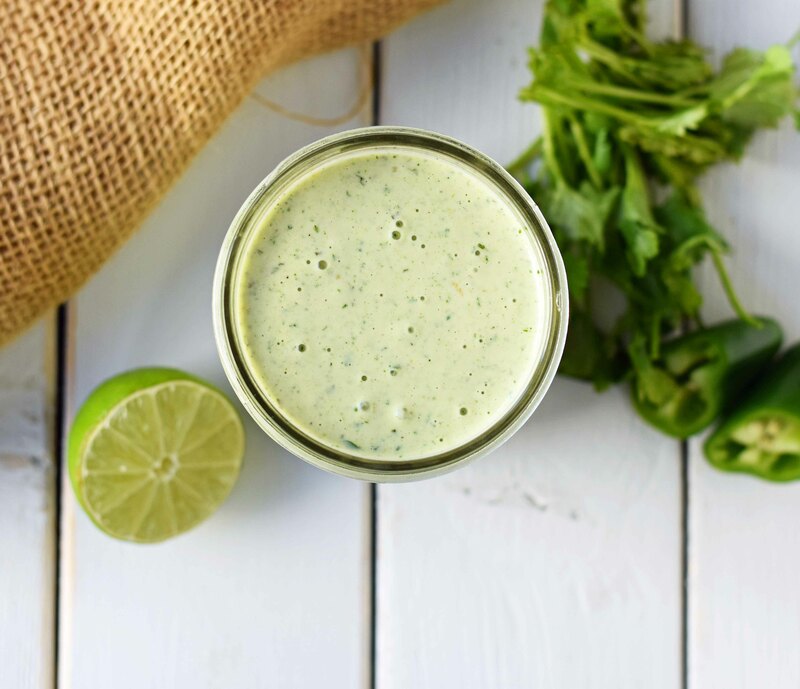 Made this cilantro/jalapeno dressing to go with some beef fajita tacos. It was very tasty, but next time I would use less ranch dressing mix. I added additional cilantro, buttermilk and some lime juice to boost the other flavors. It makes quite a bit of dip/dressing, so I’ll be able to use this on a salad this week. Love the addition of more cilantro and lime juice. Those are some great suggestions. Thank you for trying my recipe, Nancy! So easy to make and so flavorful! I would definitely recommend using half an ounce (half a sachet) of the ranch dressing mix. It was far too salty. I added more buttermilk, cilantro, and sour cream to take some of the saltiness out. It still had a good kick to it with the jalapeños. Thank you for trying my recipe! Those are some great suggestions. Thanks for sharing. Hi – thanks so much for posting your recipe (your site is beautiful). Chuy’s jalapeno dip has been my favorite for more than 20 years! One question though: your images all show a lime, but there’s no lime juice in your list of ingredients. Was that more for propping or was it accidentally omitted? We tried making your Chuy’s Creamy Jalapeño Dip. Absolutely love it just as you presented it. It won’t be the last time we make it. By far the best copycat creamy jalapeno I’ve tested. I tweaked a little my second round- a little less cilantro, 1/2 cup mayo, 1/2 cup jalps, everything else the same. Literally tastes like I just dipped my chip in the creamy at the restaurant. Thanks for this! I remember when Chuy’s creamy jalapeño was only ordered off the menu. Best kept secret and made me a little sad when they put in the menu. Now everyone can enjoy it. Sometimes it would be hot sometimes it would be more creamy sometimes more “raunchy” but this is what made it so fun to eat. Anyone can change up the recipe to their tastes. Now I can eat and maybe even bathe in it in the privacy of my own home. Will continue to make over and over. Thank you! Just made this, and it is delicious. I had a bit of Chuy’s dip left over, so I was tasing them side by side, it isn’t quite the same but it’s close enough that I will definitely make it again in the future. Thank you! As a true Austinite, I must say that this recipe tastes exactly like the dip at Chuy’s! I think I put a little too much lime juice but that was my own doing. I already shared the recipe with everyone! OMG I will forever keep this recipe. I used this for everything! Thank you so much! Awww thank you, Katey! I love to hear that! We put it on everything too. SO GOOD! Perfecto!!! I will add that I throw 6-8 garlic cloves in the blender with the peppers and cilantro, also I just used 1/2 of a standard size jar of jalepenos and half the juice. Doubled the amount of cilantro and go easy on the lime. I will say this needs to sit for at least a day for the flavor to come out. It seems kinda bland at first, optimally two days after making it, the flavor is amazing! Is everyone using the tomatillos? Do you use fresh and raw, or canned? I love this recipe so much, it tastes just like Chuy’s to me! I think adding the tomatillos is a must as I’ve done it both ways and don’t think it tastes the same without it (I used fresh)! Thank you for sharing- I put this on everything!